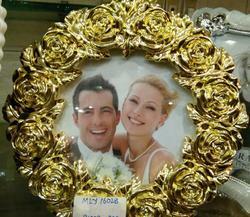 Golden Valentine Photo Frame with rose filigree work. Attractive circular lay and anglais appeal. Extremely classy and chic. Our organization has successfully expensing in the market offering best quality collection of Wedding Photo Frame that are used for making wedding collages. We are a reputed name in the industry, devoted towards offering the best quality array of Round Wedding Frame. Exclusively hand crafted photo frame with fine ceramic and stonework on it done by our specialized craftsman.Bright colours gives special INDIAN LOOK. - ideal for gifting purpose. - also preferred as wedding favors in INDIAN WEDDINGS. Our Acrylic Photo Frames offer a quick and easy way to display your images on Table Top.The Adflair Acrylic Picture Frame sets lets you easily display your favorite photo memories though a stylish frame on your Desktop or Table Top .Perfect for picture , photo , poster or certificate. We introduce ourselves as leading organizations in offering Wedding Photo Frame that can be available in different sizes. We take pleasure in introducing ourselves as leading firm by offering Wedding Photo Frame. Size: OUTER SIZE 22" X 30"